"The only land I'll settle down on will be under a tombstone." Although William S. Hart is hardly a household name today, in the silent days he was one of the foremost stars of the screen. His specialty was the Western, and unlike the Western heroes that followed him, he had grown up in the West and depicted the cowboy way of life with a loving if occasionally sentimental accuracy. In this, his final film, Hart took one of the great final moments in the conquest of the frontier and gave it his own unmistakeable stamp. In the Cherokee Strip of Oklahoma during 1889, the government lands that were leased to cattlemen were opened to settlement by homesteaders. To allow a fair chance for everyone, the prospective homesteaders were required to register and registrants were prohibited from entering into the Strip before the appointed time. Those who tried to get there beforehand were called Sooners, hence the nickname of Oklahoma as the Sooner State. When the cannon shot signalled the start of the land rush, the race was on as a hundred thousand men and women tried to stake their claims. Cowpoke Don Carver (Hart) has been working for the Box K Ranch in the Strip and concludes the roundup with comic sidekick Kentucky Rose (Lucien Littlefield). When they head into border town Caldwell, Kansas, their jobs complete, the men figure they'll move on like the tumbling tumbleweeds. But that doesn't take into account Carver meeting the beautiful Molly Lassiter (Barbara Bedford) and falling in love. Before long, Don is ready to stake a claim on the old Box K Ranch himself. But Molly's brother Noll (J. Gordon Russell) and villainous Bill Freel (Richard R. Neill) have a mind to seize the ranch themselves. When Carver goes back into the Strip to round up some stray cattle, they report him as a Sooner and arrange his arrest while they slip in ahead to claim the Ranch. It looks as if Carver will miss the land rush after all, stuck in a federal stockade, unless he can figure out a solution to his fix. 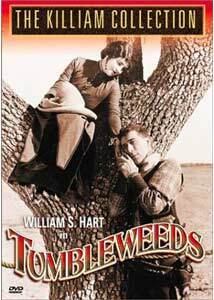 The presentation here includes the 8-minute spoken introduction by Hart from the 1939 rerelease of Tumbleweeds. While Hart's films have a tendency to become a little overly sentimental or even maudlin, this introduction goes way over the edge into hilarious mawkishness. It's an interesting bit of trivia, but it doesn't do the film proper justice at all. Though there are some overly weepy moments to the feature, for the most part Tumbleweeds is a highly competent Western actioner. The romance is hardly credible, but the sequences of the land rush are first-rate and director King Baggot (himself a silent star years earlier) uses cutting to generate a good deal of suspense. Things move briskly and the comic relief isn't as stupid as one often finds in Westerns. Littlefield isn't exactly hilarious, but he's not obnoxious either. Russell and Neill make excellent villains, and one can believe them capable of nearly anything dastardly to prevent Hart from getting the land and the girl. The film features a piano score by William Perry, and it's appropriate for the most part. Many of the dialogue intertitles have been replaced with nondescript white on black, apparently from a misguided effort at "restoration" or possibly Paul Killiam attempting to create copyright protection for his print of the film. Killiam plasters his name all over the keepcase and the film itself, as if he were somehow anything other than the owner of a print of the picture, a comic piece of egomania in itself. The film appears to be run at sound speed; although it seems a bit undercranked and thus runs fast at this speed, it's not terribly bad and in fact rather appropriate during the climactic opening of the Cherokee Strip. Image Transfer Review: The original full-frame picture is generally attractive, with decent detail and range of greys. It is tinted sepia for most of the running time, with a few bits in blue to represent nighttime. As noted above, many of the intertitles are mediocre replacements that make no effort to capture the character of the original titles (some of which can be briefly glimpsed in dissolves). The picture is a haze of scratches and minor nicks and damage, however. Even the new titles inserted by Killiam are beaten up, indicating that a worn 1970s dupe print was used rather than his original materials, which would have no doubt produced a better picture. In addition, much of the film seems far too tightly framed, indicating that there may be zooming or cropping being done here; in one instance, Hart rides out of frame to the left and a couple of beats are left on the empty screen before he reappears. I can hardly believe this was intentional, but that the left side of the film has been lost (perhaps in order to add the optical soundtrack, another reason to have gone back to Killiam's original materials). The final assessment is that it's good but it shows signs that it could definitely have been better than it is. Audio Transfer Review: The spoken intro not surprisingly has some sound issues, but Hart is quite understandable throughout. A much bigger disappointment is the sound quality of the piano score by Perry. There is a persistent noise and crackle that afflicts the track, and the music gives all the signs of having been recorded at far too high levels. In loud passages, the definition is lost and extreme clipping results. It's a very unpleasant audio track all the way around, which is a shame because the score is quite good. Extras Review: Nothing at all for extras. Chaptering is sufficient, and that's about all that can be said for it. Couldn't one of Hart's early Westerns have been added as a bonus? They're probably not releasable on their own, so this is another opportunity lost. A well-done farewell for the first great Western star, given a decent video transfer but distinctly lacking in the departments of audio and extras.